Real to Reel is a touring exhibition from the Crafts Council which presents films that are a final product of con temporary makers’ practice. Each is an artwork in its own right, and is concerned with craft and design; thematically, technically or materially. 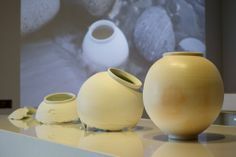 The films represent the best examples of makers and designers whose output is both three dimensional, working with materials such as clay, textiles, glass, metal and paper, and film-based.